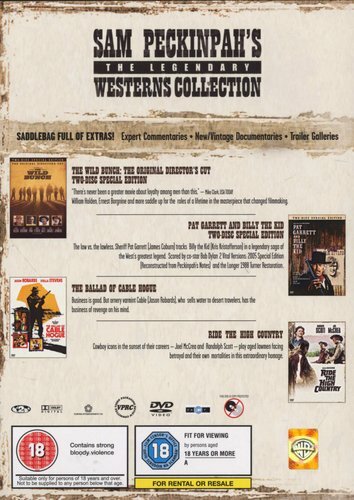 The Wild Bunch: The Original Director's Cut (Two-Disc Special Edition) - William Holden, Ernest Borgnine and more saddle up for the roles of a lifetime in the masterpiece that changed filmmaking. Pat Garrett And Billy The Kid (Two-Disc Special Edition) - The law vs. the lawless. 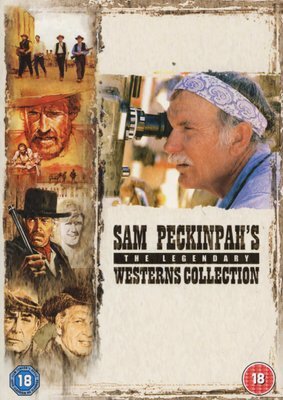 Sheriff Pat Garrett (James Coburn) tracks Billy the Kid (Kris Kristofferson) in a legendary saga of the West's greatest legend. Scored by co-star Bob Dylan. 2 Vital Versions: 2005 Special Edition (Reconstructed form Peckinpah's Notes) and the longer 1988 Turner Restoration. The Ballad of Cable Hogue - Business is good. But ornery varmint Cable (Jason Robards), who sells water to desert travelers, has the business of revenge on his mind. Ride The High Country - Cowboy icons in the sunset of their careers - Joel McCrea and Randolph Scott - play aged lawmen facing betrayal and their own mortalities in this extraordinary homage.